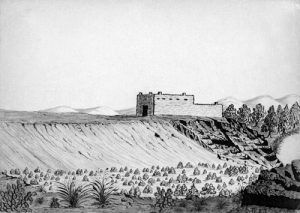 Bent’s New Fort (1849-1860) – In 1849, William Bent, had successfully run Bent’s Old Fort near present-day La Junta, Colorado for nearly two decades. However, during the Mexican-American War, his successful trading post had been overrun by soldiers and trade suffered because the Indians were reluctant to come near the post when so many whites were present. Other factors, including the assassination of his brother, Charles Bent, and a cholera epidemic eventually caused the demise of his popular trading post. Disillusioned, William Bent abandoned the fort, moved 38 miles down the Arkansas River, to the Big Timbers locality, a favorite Cheyenne and Arapaho campground. There, he erected a temporary log stockade on the north bank of the Arkansas River and resumed trading. In 1852-53 he replaced the stockade with a permanent stone structure that came to be known as Bent’s New Fort. Resembling Bent’s Old Fort, but smaller, it consisted of 12 rooms surrounding a central courtyard. It had parapets but no bastions and cannon were placed on the corners of the roof. The walls were 16 feet high. Bent’s new trading post was not a success, as by the time of its founding, the Indian trade was rapidly decreasing. Emigrants, gold seekers, and increased freight traffic had made the Arkansas River a main-traveled highway. They felled the cottonwoods at Big Timbers and frightened away the game. In 1860, troops began construction of Fort Wise, later called Fort Lyon, a mile southwest of Bent’s post. He then leased the fort to the U.S. Military, and it was then used as the Upper Arkansas Indian Agency and Commissary for Fort Wise. Bent then moved upriver to the mouth of the Purgatoire River, where he built a wooden stockade and lived there until his death in 1869. The buildings of Bent’s New Fort disintegrated many years ago, but remains of the earthworks can still be seen. The site, indicated by a marker, is situated on private property in Bent County, Colorado, on a secondary road about 1 ½ miles south of U.S. 50, some eight miles west of Lamar.